Tomatoes, tomatoes, tomatoes. Are you guys sick of reading all the things we canned with them? The end is in sight. We can almost see the finish line. For lots of you tomato season is nearing to an end if it hasn’t already. But, for the few who still have tomatoes growing in the garden and want to try something different this next recipe is sure to hit the spot. In fact, it’s new for us as well. With a few mangos left over from the Parrots Head Spicy Salsa and a lot of tomatoes we thought this little gem would be a nice addition. We’ve used the Complete Book of Small Batch Preserving, by authors Ellie Topp and Margaret Howard, a lot this season (a lot) because we love how each and everything we’ve tried turns out. The only thing we’d have to say is the recipes yield only a handful of jars at a time. For many, this works well because it allows you to try something new on a small-scale to determine if you really like it. While, for others (like us), they are too SMALL. We hate seeing a half full water bath canner. So, we often double, triple, and sometimes quadruple the recipes. While, you’ve probably heard warnings against double batching because it will compromise cooking times, throw off consistency, and leave you with a poor tasting product; we are here to assure you this is not the case for the salsa and chili sauces from this book. In fact, the cooking times were not increased and we can assure you the consistency and taste was spot on each time. Where you should be careful not to double batch recipes is when making jams and jellies. Food in Jars explains why in this post. The recipe below is for a single batch but if you think your family is really going to enjoy it, go forward with confidence and double the batch. We did! Prepare for water bath canning. Sterilize jars in oven at 250F for 30 minutes. Note: this can be done while the preparation is cooking for an hour. 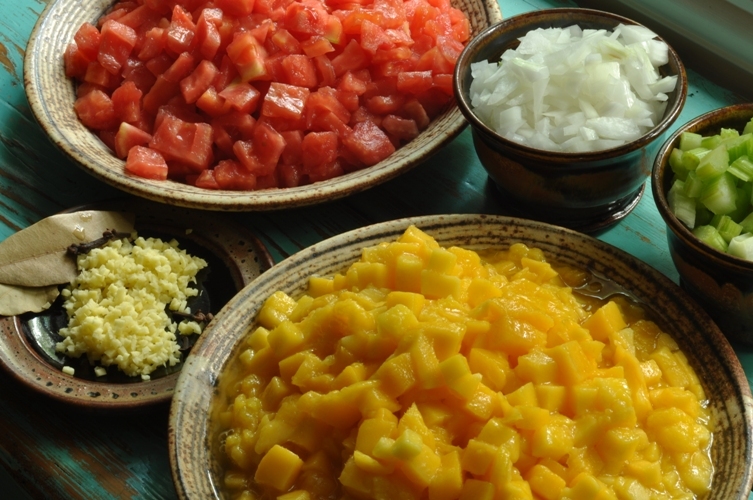 In a large stainless steel saucepan combine tomatoes, mango, chile or jalapeño pepper, vinegar, pineapple juice, onion, celery, gingerroot, cloves and bay leaf. 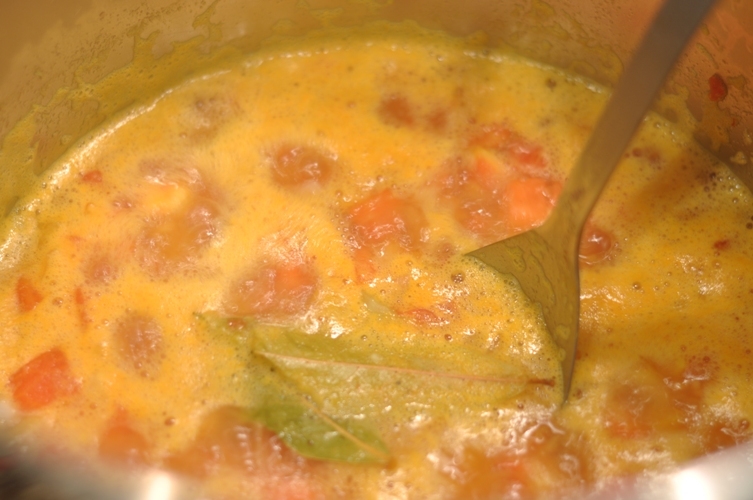 Bring to a boil over high heat, reduce heat, and boil gently, uncovered for 1 hour or until thickened. Stir occasionally to prevent it from sticking to the bottom. Add sugar and salt. Return to a boil and boil gently for 10 minutes. Remove from heat and discard bay leaf. 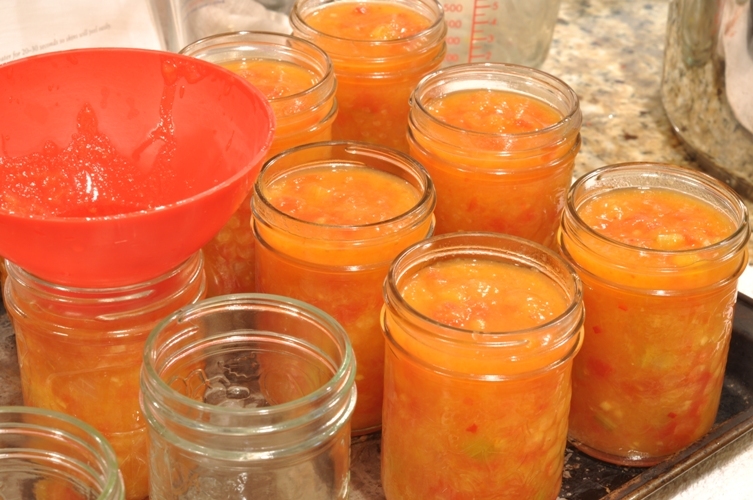 Ladle hot chili sauce into hot sterilized jars leaving 1/2″ headspace. Remove air bubbles, wipe rims, place lids and screw bands on adjusting so that they are just finger-tip tight. Process 250mL (half-pint) jars for 15 minutes and 500mL (pint) jars for 20 minutes in a hot water bath. sounds yummy.. what would you put it on?? I like to eat the chili sauce with eggs but it is a must for meatloaf!